My intention for 2012 was to have a solo exhibition of just the Dogs paintings. The Artist's Room Gallery in Dunedin, NZ, very kindly offered to host the show in July. The exhibition was very successfully received and sold out three days prior to it opening! "Rosie".... The tattoo is from a Stone Roses song. "Lou Lou".... Named after Lou Reed. My piece in the Miles Art Awards exhibition at the Tauranga City Art Gallery, 2012. Tattoo reads: "My heart's aflame but God I like it"
"EL PERRO DE LOS MUERTOS... Every Dog Has It's Day". Inspired by the Mexican El Dia De Los Muertos, The Day Of The Dead festival when people paint themselves with skulls and flowers, etc. to celebrate the lives of departed loved ones..... Unlike our Hollywood-ized "Hallowe'en". The portrait is of Frida Kahlo, the surrealist painter. The scrolls read : "Lay your head where my heart used to be - On the earth above me." From the Tom Waits song "Green Grass". "El Perro de los Muertos". watercolour. A2 size. A bit of a punky pup, this one. Tattoos read: "Hey Lord - Don't Ask Me Questions..... There Ain't No answers In Me". The Hei Tiki carving hung around the neck would usually be carved out of Pounamu, or New Zealand Greenstone.... But I thought the bright red would look rather fetching against the colour of the dog. Named Tui after the Tui brand beer bottle cap worn as an earring. Tattoo reads: "TOO TRUE TO BE GOOD"
Lots of Bowie references here: Ziggy Stardust, Diamond Dogs and the tattoo reads: "The Prettiest Star". The Dog Star. Brightest star in the sky. Bright because it's a binary system... Hence the two stars over the eye. The tattoo reads: "The Heart Is A Lonely Hunter". Another superhero. Using the New Zealand Air Force insignia for his (slightly baggy) costume. The idea for a green dog has been brewing in my head for a while. The "moko" is an adaptation of some Celtic spirals and Maori-style tattoos. The tattoo reads: "Heartbreak to hate". She likes bloody-bones and biscuits.... and love and cake. Stencil graffiti image of surrealist painter Salvador Dali worked into the markings of a young English Bull Terrier pup. 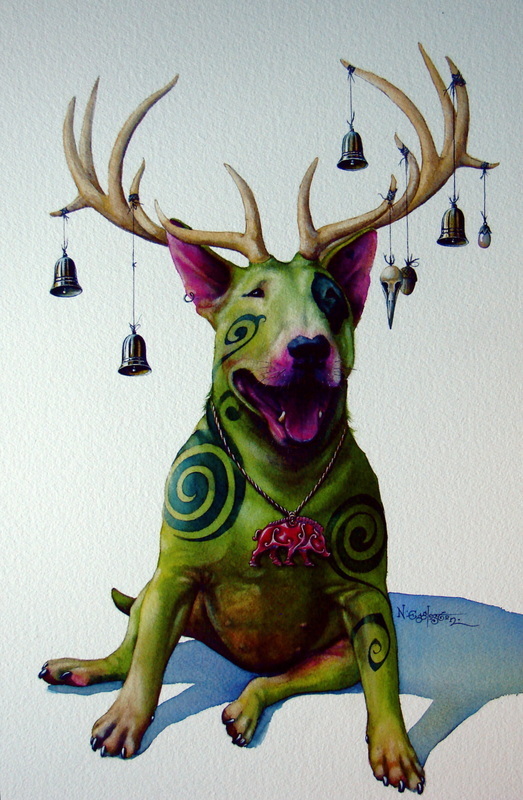 Named after the French surrealist playwright, Alfred Jarry, character "Pere Ubu", this English Bull Terrier just looked right for the part. The first time I saw a Boston Terrier I thought "Wow!... They get to wear superhero costumes! "Bruce". Watercolour. 20cm x 40cm.